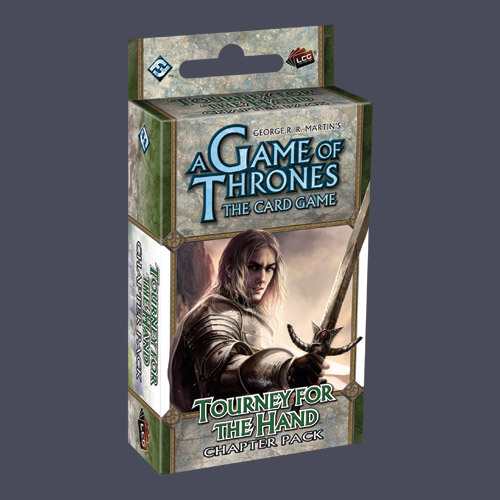 Tourney for the Hand is the first pack in the A Tale of Champions cycle and is themed around the great tournaments of Westeros. This Chapter Pack features 60 fixed cards (3 copies each of 20 unique cards) for A Game of Thrones: The Card Game. The never-before-seen cards in this expansion introduce two new keywordsâ€“melee and joustâ€“new elements that will create thrilling new deck-building opportunities and strategies for A Game of Thrones. Featuring new versions of favorite characters like Arya Stark, Ser Jaime Lannister, Knight of Flowers, developed especially for the new environment of A Tale of Champions, as well as introducing brand-new characters like The Knight, Dorea Sand, and Meera Reed (designed by 2010 Castle Stahleck Champion Andrea Gualdoni), Tourney for the Hand has plenty to interest A Game of Thrones players, both new and veteran. An A Game of Thrones: The Card Game core set is required to play. Contains cards 1-20 of the A Tale of Champions series.